Even a dilettante like me is aware that the late 70s were a storied age for Jamaican music. The flow of talent and money between Kingston and London was starting to open up world markets to reggae, with Marley a superstar and punk drawing social (and increasingly musical) inspiration from roots and dub. In London, the sweeter sound of Lovers Rock was scoring occasional, deathless pop hits. In Jamaica, a fresh generation of MCs and singjays were starting to make waves, men who would become the stars of early dancehall. And in New York, techniques imported by reggae DJs were setting trends in motion that would transform pop’s vocabulary. So far, so historical. And then sneaking past the Kintyre titan for a week in the wintry sun was this, the most wondrous of one-hit wonders. If you want proof of the appeal of “Uptown Top Ranking”, try this: I have never once, that I can remember, seen anyone decry it as inauthentic, or sold-out, or frivolous or unrepresentative of Jamaican music. Nobody resents it, in other words. How could they? The appeal of Althea and Donna is double-edged. Look at the Top Of The Pops performance: two gawky teen girls in their khaki suit an’ ting, trying to groove rather than giggle to the house band parping its way through a Joe Gibbs rhythm track. They are adorable, but in that setting not too far away from Baccara – and that’s the context which probably pushed “Uptown” from a Top 20 hit to a Number One. God bless novelty, when it gives us this! On record, though, the girls are significantly blanker, more reserved – cooler than anyone who might be listening. They bite at lines – “seh mi in mi halter back / seh mi give yuh heart attack” – and they hit that zone where awkwardness suddenly morphs into supreme confidence, the telepathic forcefield of front that makes girl-gang pop from the Shangris to Shampoo so irresistable. I used to listen to this thinking “no pop no STYLE” was a dismissal – of whatever grown-ups or squares or bores might be listening. My comprehension might be off, and those enemies might be straw men, but it still sounds like the most joyful put-down on record. hardly the same thing. Strummer and co. actually made good on their evident love of reggae, dub etc. by moving their sound closer towards it, getting Lee Perry to produce, involving Mikey Dread etc. You might want to tell Joe Strummer that. I find that in most cases I prefer the results of this process to what the bands sounded like before. Certainly this is true with all of the acts we’ll be talking about on Popular who set about this (some more successfully than others, from an artistic pov), including those who jumped on the disco bandwagon as opposed to the reggae one. But I knew these records before the songs and artists they ‘ripped off’ and there are emotional ties born of ignorance that can’t (and in most cases needn’t) be shaken. except “that one about black and white people living together on pianos” SB yellow card etc. considering how much this song is part of the cultural landscape, not to mention how great it is, it’s amazing how little utr actually gets played. i don’t think i’d ever heard it until it was on simon bates’ golden hour while i was at university in the early nineties (when i must admit my excitement was mainly to do with finding the source of PWEI’s ‘no pop no style’ sample) and since then I’d be suprised if I’d heard it much more than ten times – it would pop up on totp2 every once in a while but you never seem to hear it on radio 2 or capitol gold. shame on them! Radio 2 and Capital Gold don’t like black music unless it’s Dock Of The Bay or Move On Up. Like others upthread, I was aware of UTR from the summer of 1977, when Peel was heavily championing it. I taped it off the radio, where it sat next to The Clash’s “Complete Control” and the first Slits session on the same side of the same C90. Happy days. What’s remarkable about UTR is the way that the “Three Piece Suit” backing track (featuring an early outing for Sly and Robbie) sounds tailor-made for Althea & Donna’s vocals: as if it had been expressly recorded with the girls in mind. What’s equally remarkable is the way that A&D’s standard two-note toasting melody in the verses (that particular interval was used time and time again as I recall – Ranking Trevor to thread?) sit so light and fresh within the context of the tune, transcending the restrictions of their convention. Predictably, A&D’s misfortunes started with their new label Virgin’s disastrous choice of follow-up single “The Puppy Dog Song”: a banal reggae-fication of the “frogs and snails and puppy dogs’ tails” nursery rhyme, complete with an introductory piano figure lifted directly from “Chopsticks”. As Brotherhood Of Man could have told them, it’s really never a good idea to follow a Number One single with a song about a cute little puppy dog. 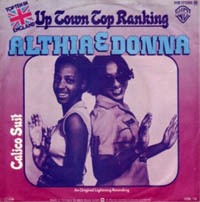 What’s remarkable about UTR is the way that the “Three Piece Suit” backing track (featuring an early outing for Sly and Robbie) sounds tailor-made for Althea & Donna’s vocals: as if it had been expressly composed and recorded with the girls in mind. actually, R2 and capital do play quite a lot of the obvious motown and stax stuff along with a smattering of disco and funk. but yes, not much reggae unless it’s ‘jamming’ or by eric clapton. you do sometimes hear the israelites though. i think it may be a while before mobb deep are playlisted. #40: unless you’re Gilbert O’Sullivan. Not too long after this one, Althea herself (sans Donna) put out “Downtown Thing”, sounding much more, er, “experienced”, even talking about “me drink up de Heineken”. Strictly roots indeed. You gotta give Paul Nicholas props for inventing the Scissor Sisters on “Dancing With The Captain” though. The Bunny wants a word with yous. ah now you have pointed out something I did not. Bunnykins is gonna do the pair of you. He’s hard like that. Any excuse will serve a tyrant. Oddly, I can’t remember any of this. You MUST have remembered it. You’ve just quoted it word for word. I don’t remember Peel championing Lene Lovich, either – and I was an almost nightly listener in the late 1970s. However, my trusty Garner guide tells me that Lene did in fact record a Peel session in November 1978, followed by a second session in December 1979 (i.e. well after her chart breakthrough). I think this is that Top Of The Pops performance with tedious TOTP2 Elvis Costello fact (since I’m on Youtube duty today). brilliant clip thanks Pete :-) George Berry was obviously better at football than singing along with the BBC concert orchestra! Well, ideas being ideas, the only time I considered a wacky internet alias, I came up with “Bela Lugosi’s Dad”, to some humorous appreciation from some folks. So, I did the honourable thing and googled it, and yep: Not the most original alias. So, I sacked the idea before using it. There was nothing wrong with the TOTP appearance!!! I remember this being number 1 but I think 6-year old me was probably quite baffled about it at the time having never heard any reggae before let alone anything as authentic as this with the patois along with the syncopated rhythm. Now, of course, I’m in total agreement with everyone – it’s fantastic – 9 for me too.